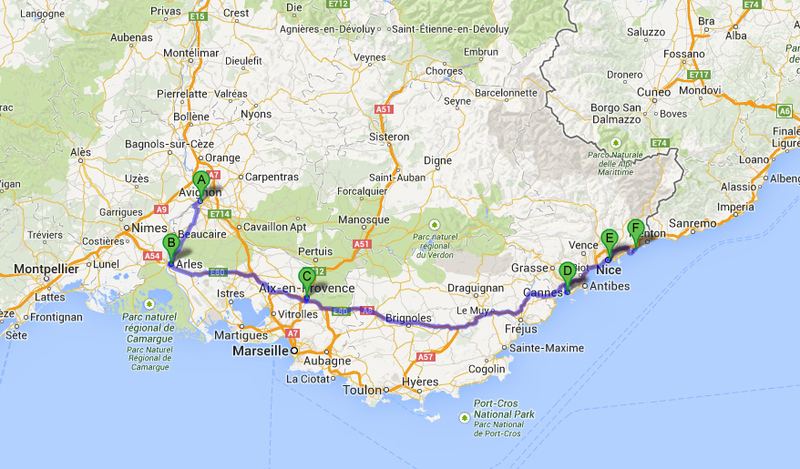 Avignon was the first stop on the list and contrary to the weather forecast, not only did it not rain but it was HOT! First on the agenda was the Palais des Papes, the seat of seven popes from 1309 to 1378. It was interesting to learn about the different ‘regenerations’ the palace had been through through various popes. There were some impressive frescoes and wall paintings as well. I then headed to Avignon’s other main claim to fame – the St Benezet bridge; better known as the Pont d’Avignon and star of the children’s folk song of the same name. As you would expect, as the ruins of a medieval bridge there wasn’t exactly a lot to see, but the did have an exhibition on a huge project they’re doing to try and determine the exact original form of the bridge, which was involving about 6 different research labs. After wandering round the city for a couple of hours I headed back to the hostel and met some other girls in my room; Beth from Melbourne and Julia from Germany, and we headed out for dinner. Next stop was Arles, a little town best known (as far as I’m concerned) as the home of Vincent van Gogh for just over a year between 1888-9; where he painted 300 paintings in the year before his death. That’s why I was heading there, and fortunately Beth came too to check the place out. The first thing that I noticed about Arles was that it was really colourful. I haven’t been homesick, but one of the things I’ve missed the most about home (or found the most depressing about France) is all the colours of the city – not just the New Zealand landscape, but all the brightly painted Wellington houses, which are instead replaced by endless grey, concrete or stone apartment blocks and country houses. In Arles, although it was the same sort of buildings, all the houses had pastel-painted shutters, which definitely cheered the place up on the dreary day! We started off at the tourist office where picked up some maps with walking trails around the city. There were four; one for antique, medieval, renaissance/modern Arles and the van Gogh trail. The latter took us round the sights of some of the paintings van Gogh did in the town, with plaques setting an image of the work at the same angle it was painted, if that makes sense. It turns out Arles has a rich roman history as well and there were a lot of big archaeological sites, including les arènes – the big arena which is today the home of carmargue horse shows (the French, non-violent bullfighting). It’s the 5th biggest left, I think. After Beth went back to Avignon for the night I headed back to where I was staying, and discovered that it was in fact a pilgrim house for people travelling the pilgrimage to Santiago de compostela in Spain, as Arles is one of the stops on the route; and all the other inhabitants were in the 50+ category. The crazy one was naturally in my room. It was fine for one night though and I met the first Kiwi I’ve run in to the whole time I’ve been away, apart from those who are my friends in Lyon! The next day I set off bright and early for aix-en-Provence, a big university town half an hour from Marseille, and, you guessed it, former haunt of Paul Cézanne (long story short – turn of the 20th century, impressionist/post-impressionists headed to the South of France for the light. Although Cézanne was from Aix. As you were). As there is inexplicably no hostel in aix, I was trying out couchsurfing for the first time – and I had a great experience! I was picked up from the train station by a lady called Julie, who wasn’t able to host me as she already had someone, but nonetheless ‘hosted’ me for the day as I wasn’t able to meet my actual host till the evening. After dropping my bag off at her house we headed into town with Emmy, her surfer from Germany, and started out on the Cézanne trail. Although there were a lot of places on the list, this wasn’t as interesting s the van Gogh one – lots of ‘church where Cézanne’s niece was baptised’ type thing to pad it out. What was interesting to see was the atelier Cézanne, where he lived and worked and had especially built. You weren’t allowed to take photos but the whole top floor was the studio with one entire wall windowed so he could paint directly from his garden. Although the setup was changed to accommodate tourists, there were still heaps of objects that he used in his still lifes and there was a cool display rolling through all the different paintings and the objects in them. Julie then drove me out to see the Mont Sainte Victoire, THE mountain that Cézanne did a shitload of paintings of. We stayed out there for a couple of hours and also walked around the dams up there, before we headed back in and I met up with Léa, the girl who was hosting me. She was really nice and we had a nice dinner with her boyfriend, who had lived in London and now has a cockney accent when he speaks English = hilarious. The next day was a slower start as I got the train to Cannes, arriving around 1pm. I didn’t have very high hopes, but as the Festival was on and I was in the area I couldn’t NOT drop by. I was just planning on hanging round for the afternoon before I went on to Nice for the evening. As it turned out, however, there are some film screenings open to the public! One theatre was free and for the other you had to buy a €7 ticket; essentially having a ticket didn’t guarantee you would get in though so, once you got a ticket you had to line up a couple of hours early if you wanted to get a seat. There was also an open-air cinema on the beach in the evenings but that was no good for me. So, after finding a hotel that was willing to take my bag for the afternoon, I headed off on the hunt for tickets. I had to go allll the way to the other end of the croisette (the boulevard) to get to the ‘free’ theatre first of all, but it seemed they gave out allocated tickets and only had some left for a 10pm screening – again, no good. So I headed to the booth for the other theatre and found out that, though you had to pay for the tickets they were generic and could be used for any screening (i.e., if you waited in line and didn’t get in you could try again with the same one). There was only one film I could get to which was at 5pm, and working back from when I would have to line up I had just over an hour to play with. I fin ally grabbed some lunch around 3pm, and raced all the way down to the other end of the croisette to go up the hill to the lookout over the city. There was a museum which I didn’t pay any attention to apart from to go up the tower. At 4pm it was back to the cinema to line up and, thankfully, I made it in! I was too scared to take photos on the way in but it was a couple of storeys underground in a hotel, with a giant red carpet and lots of fancy decorations. Inside it was bizarrely just a free-for-all to find a seat and it was also interesting to see the differing ranges of attire amongst the different parties. Before the film the director and the stars came on stage to introduce it and at the end it was a bit weird; we all sat n the dark but a really bright light shone on their row of seats and everyone clapped and it eventually turned into a mob surrounding them before they eventually left. I wasn’t really a fan of the film itself; called the Selfish giant, directed by Clio Barnard, but it was the only one I was able to see and I wasn’t rally there for the sake of the film was I? After the screening I met up with a friend from Wellington, Sarah Reese, who organises the French Film Festival in NZ so was in town for work. It was really cool to catch up for the first time in over a year and we got the train home together as she was staying just out of nice. Was horrible. Does anyone remember me complaining about being a downed rat when I went to Marseille for the day? Well, this was worse. In the 5-minute walk between my hostel and the tourist office I got absolutely soaked, despite having a full-length raincoat and umbrella (the very same that I had had to buy in Marseille); with everything in my bag getting completely drenched as well. The day was not off to a good start. After hiding inside the tourist office until I’d completely planned out where I was going to go and how I was going to get there, I set off like the trooper I am to get some breakfast on the way to my first museum. Mother Nature had other ideas though and after it started bucketing down even more (I didn’t think this was possible), I had to hide in a souvenir shop and splash out €10 on a proper umbrella. While this goes against most of my principles it was totally worth it, although I have unfortunately had to ditch it in Lyon as it’s too big to travel with. I went to the fine arts museum which was underwhelming, and then attempted to head to the Matisse museum. I managed to get on the wrong bus which did not help matters. I eventually arrived though and battled through all the pensioner tourist groups with their umbrellas (new pet hate/phobia). The collection was made up largely of donations from the Matisse family and had a lot of his later stuff; collages and plans for the Chapel et Vence. After that I headed to the Marc Chagall museum’ rinse and repeat. I have a poster of one of Chagall’s paintings and can say that our really have to see them in person to appreciate the huge strokes of colour and their size. After that I headed past a few more places on my way back to the hostel, where I just changed my socks and went off to have dinner with Sarah (I was still saturated and didn’t want to end up with a second pair of wet shoes). I got the train to Villefranche, where Sarah was staying for the festival with her mum who’s doing a three-week intensive French language course there. It was still pouring but I dried off a bit while we had nibbles in their apartment, and it had miraculously stopped raining by the time we went out in search of food. We found a cheap and cheerful restaurant which was doing a roaring trade and, despite some questionable service, did have a good food and a great evening. On the last day we finally got a bit of sun and I headed off to Monaco for the morning, as you do. The 40 minute bus ride around the cornices cost €1. I’d like to see what Metlink has to say about this! Once I got there I roamed around the casino/waterfront for about an hour or so, then got the bus up to the old city and the palace. I was very impressed with the palace tour; although there wasn’t a lot to see and I was a bit over it by then, the audioguide was easily the most comprehensive of any I’ve had et all the various places I’ve visited. Around 1pm I got the bus back to nice and wandered around a bit and visited the gardens/lookout before getting my train home. And that was it! I then had two days to pack everything up before I headed to Athens, and have since been to Budapest, Vienna, Prague, Berlin and now Amsterdam. Not sure when the next blog will be but it will happen eventually!